Alas, many of those in power with the greatest need to read this book are least likely to do so. 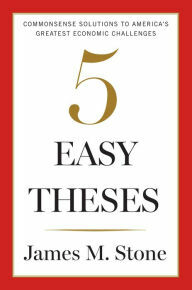 It will come as no surprise that the five theses that James Stone poses are easy to articulate but very, very difficult to act upon, especially now when the world seems to have become more volatile, more uncertain, more complex, and more ambiguous than at any prior time that I can remember. Also consider this. In 1865, a German physicist, Rudolph Clausius (1822-1888), coined the term entropy during his research on heat. The word’s meaning: “a turning towards” (in Greek, en+tropein), “content transformative” or “transformative content.” Claudius used the concept to establish a mathematical foundation for the second law of thermodynamics: without the injection of free energy, all systems tend to move (however gradually) from order to disorder, if not to chaos. To repeat, James Stone offers solutions — that will be debated — to the major problems that no rational person can deny. I have no idea to what extent (if any) his book will have any impact but I thank him for it nonetheless. Who knows? Perhaps someday, a grateful nation will honor him. I do so now.